A further offering from John Alsop whose only thought is that this one may be near to Roade. John also wonders what the box is that is in the picture. The newly-built cabin is Type 5 and the location is Hanslope, looking South. The new up goods loop from Ashton to Hanslope (far left) was brought in on 15/12/07. This suggests a date for the photo of 1908 or 1909. Note the beautiful tall signals! Hanslope box closed on 29/04/62 when the loop was removed. This could be Sears Crossing between Leighton Buzzard and Cheddington. The site is the present day Ledburn Junction. The only loop in the Roade area on the four track railway was at Ashton on the up slow side and the box (Hanslope) was on the opposite side of the end of the line by the down fast. Not so - I am certain that Hanslope cabin was actually on the up side, although it is wrongly shown as on the down side in British Railways Layout Plans. It is also wrongly shown on the official LMS "strips". I have the idea that this shows the position of the pre-1907 box which was replaced when the up loop opened, and the records were not updated properly - something not completely unknown. Until 1907 the block sections were Roade - Hanslope (2m 533 yd) and Hanslope - Castlethorpe (2m 1089 yd). Ashton was added 1m 328 yd from Roade. The location cannot be Sears Crossing which was on the down side as well, about midway along the up goods loop. The box controlled both the entrance to and the exit from the up loop. 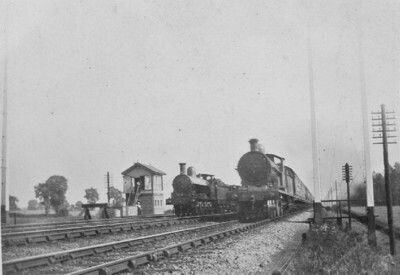 In fact new (Type 4) cabins had been erected at both Ashton and Hanslope in May 1898, but neither was in a suitable position to operate the loop points, so new Type 5 cabins were provided at both locations. Both were Size D, 20 levers, with a 2-2-2 window layout as shown in the picture. Sears Crossing cabin (opened October 1912) was Size E, 22 levers, 2-3-2 window layout. I can find no other possible location for this picture other than Hanslope. I am grateful to John Hinson of the Signalling Record Society for pointing out that the location is in fact Ashton. We are looking at the back of the buffer stops in the trailing trap points at the end of the up loop, which starts here. That means that my comments about Hanslope being on the Up side of the line were totally wrong. So much for 55+ year old memories! One reason why I believed that Hanslope was situated on the Up side was that were it on the Down side (as it seems it was) firemen of trains detained in the Up loop would be obliged to cross four running lines to reach the box to carry out Rule 55. Highly dangerous, especially at night or in bad or foggy weather! Exemption to Rule 55 could be given by written instructions to the contrary, but even if this applies here my objection remains valid as signalmen might need to pass instructions to train crews regarding relief crews and son on. The location of this photograph is certainly Ashton, taken at close proximity to the 58.5 milepost on the London to Rugby Line. The crossbars on telegraph posts here were always secured on the London side, which confirms that the photographer was working on the Down side of the line. Another feature here is that the distance between the cess and the boundary fence began to widen at this point to accommodate the underbridge on the Ashton to Hartwell road thus providing the photographer with a place of safety and enabling the camera to be angled (assuming a tripod was used) to such good effect. A third feature is the copse shown on the right hand side of the photograph, which can still be seen. Fourthly just above the brickwork level on the signal box is some lettering (which I am unable to decipher) but the spacing of which fits ASHTON. Lastly I have calculated a map coordinate for the signal box which is 52.140408N-0.877042W. If the location is viewed from this perspective it can be seen that what I have written comes together. Those who have opted for Ashton box are quite correct. I was a fireman at Northampton during the war years and beyond, and have spent many hours in Hanslope loop. The bobby at Ashton would stop you at his home signal, then call you forward with a green flag or lamp, and as you passed the box he would shout how many trains were already in the loop (could be up to five), so one had an idea of how soon to be prepared to stop at the break van of the train in front. By the way, Hanslope box was adjacent to the down fast line, and one never had to negotiate the four running lines to carry out rule 55, a short toot on the whistle sufficed. See the book Off Northampton Shed. The double signal post on the R is probably for the Down Fast splitting distants for Roade Junction. There may be a double post on the left, also, but out of view. Just to correct my previous post: the distant signals for Roade Junc were not here, but further north. The two posts are (in fact) for the Down Fast and Down Slow home signals - insuffient room between UF and DS for the latter. They had to be tall, so that the driver of a train on the Down Slow could see over the top of any standing or passing train on the Fast lines. One or other of the trains in the photo may have been standing at these signals. For further detail, the 1898 cabin was at 58m 75c approximately and only 1404y from Roade Junction. The 1907 cabin for the loop was 682y nearer Bletchley at 58m 44c, just to the south of underbridge 200 for the Ashton to Hartwell road.